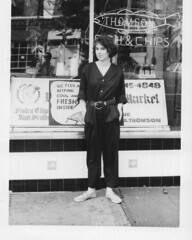 Photo of me taken in 1985 outside a fish market in Bay Ridge, Brooklyn. I sewed that jumpsuit myself. Clever girl, huh! I recognize that storefront. Brings back some fond memories.